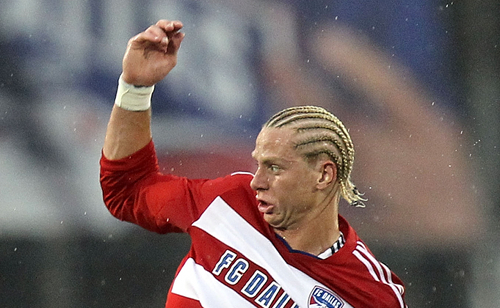 The United States’ latest “it” boy, Brek Shea, is currently training with Arsenal. Some say the 21-year-old American could be the real deal, but if his skills don’t make it in the Premier league, at least his look will. About once a year or so, when rumours swirl that an English club has been licking its chops over a promising young player from the United States, ears tend to perk. Whether that’s because the world genuinely awaits America’s first soccer superstar, or they just enjoy a good laugh about “another overhyped American,” we don’t know. But here in America, the hype around Brek Shea is palpable. And that’s because we haven’t really seen a player quite like him in, well, forever. Shea, a 6ft 3in, left-footed winger, has the full toolset: size, speed, technique, and versatility. For newly installed USA manager Juergen Klinsmann’s national team, he’s established himself as the future of the left wing. For his Major League Soccer club FC Dallas, he’s played everywhere from second striker to winger, midfielder, and even left back. Shea’s size and toughness, along with his 10 goals for Dallas this season, has scouts thinking the blonde-haired, blue-eyed kid from Texas is a talent best suited for England. Liverpool and Manchester City scouted him over the weekend. Manchester United have had him on their radar since the summer. As a result, his agent is gushing, "I do know people are asking me about Brek as he is the premier talent in America," Barry Mclean told Sky Sports, “I think England would be a interesting option for Brek, but we will wait and see what happens.” But here’s the catch. Shea, who did train with Bolton in October 2007, just signed a three-year contract extension with the FC Dallas in May, and with some skills left to refine, another year in MLS wouldn’t hurt him. For this reason, it’d be reasonable to think Shea goes on loan to England in January, but probably not to one the clubs vying for a Champions League spot. Other teams in search of some size and athleticism (Bolton or Everton?) would be foolish not to give Shea a shot. And besides, wouldn’t you take a chance on “the next Gareth Bale”? Certainly though, Shea is aware that American youngsters have a track record of leaving the nest too early, only to get lost in the fray in Europe (remember Freddy Adu?). Therefore, many wouldn’t mind if Shea took a more Clint Dempsey-like exit from our domestic league. Dempsey, who enjoyed a healthy 3-year stint playing under Liverpool legend Stevie Nicol with New England Revolution, wasn’t snapped up by Fulham until age 23. Now, at 28, he’s the Cottager’s highest active career goal scorer (41). I guess it’s not a bad path to follow. Like Dempsey, the biggest draw about Shea is his creativity. But what sets Shea apart is his eccentricity on and off the pitch. Shea is a true lefty – freethinking and inventive. He expresses himself through six tattoos, his own abstract art studio, and a medley of unconventional hairstyles, be it cornrows or faux hawks. His unique image is one of a truly edgy footballer that America has hardly been familiar with. So please, excuse us for the hype. But at 21, Brek Shea has become one of the brightest talents in American soccer. And he’s far from a finished product.